Check, Money Order or Purchase Order: To pay by check, money order, or purchase order see the instructions that appear below the rate (fee) tables on this page. International VISA letters: See the instructions that appear below the rate (fee) tables on this page. STUDENT DISCOUNT: Get 50% OFF your entire order! Use the promo code STUDENT when you purchase your tickets to get 50% off of your entire order. Requires a valid student ID (bring your student ID to the event). All Access Passes: All Access Passes provide access to ALL aspects of IMMERSIVE ITALY and the 6th European Immersive Education Summit (EiED 2016) for all 3 days of the event. All Access Pass holders enjoy complete access to all keynotes, all featured talks, all presentations, all papers, all demonstrations (demos), all hands-on workshops, all social events and activities, and all meals. All Access Passes include an Immersive Education (iED) Virtual Reality (VR) headset, "Virtual Reality (VR) in Venice" hands-on workshop and gondola ride, and social networking dinner in Venice on Day 1 (Tuesday June 21). All Access Passes also include the Immersive Meal lunch and social networking event and all hands-on Exhibits during the Immersive Meal period on Day 2 (Wednesday 22 June) in addition to the "Augment your own Reality!" 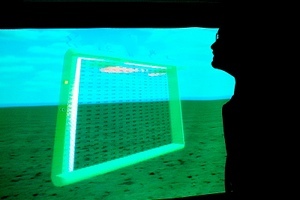 hands-on Augmented Reality (AR) workshop on Day 3 (Thursday 23 June). Day Passes: Day Passes provide access to all activities (keynotes, featured talks, and all sessions listed on the program and schedule of events) for a specific day of the event (Day 1, 2, and/or 3). 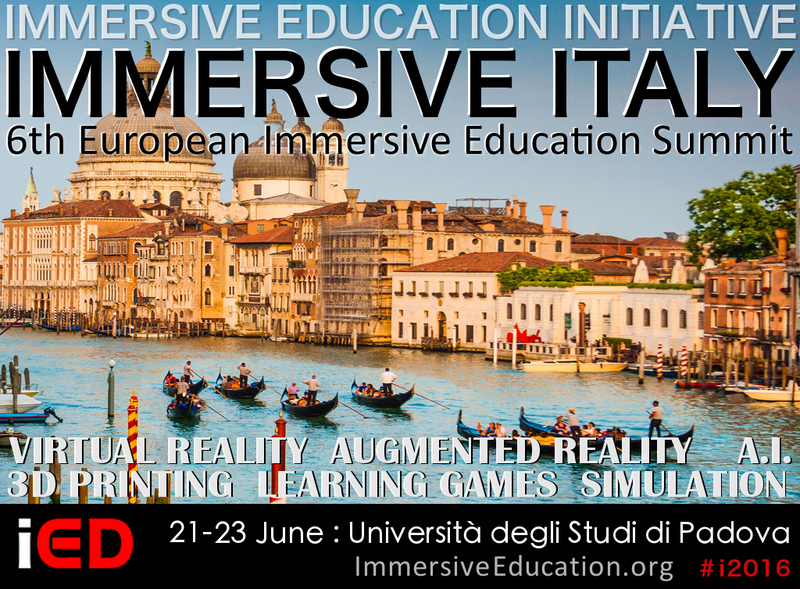 All Day 1 passes (Tuesday June 21) include an Immersive Education (iED) Virtual Reality (VR) headset, "Virtual Reality (VR) in Venice" hands-on workshop and gondola ride, and social networking dinner in Venice. Day 2 passes (Wednesday 22 June) include the Immersive Meal lunch and social networking event and all hands-on Exhibits during the Immersive Meal period on the 22nd of June (lunch food and drink is included with the Day 2 pass). 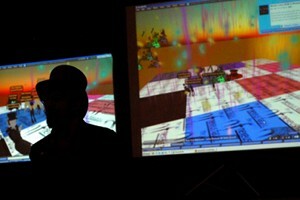 Day 3 passes (Thursday 23 June) include the "Augment your own Reality!" hands-on Augmented Reality (AR) workshop. Immersive Meal and Exhibits Passes: All Immersive Meal and Exhibits Passes provide access to the Immersive Meal lunch and social networking event on Day 2 (Wednesday 22 June) in addition to all hands-on Exhibits during the Immersive Meal period on the 22nd of June. Lunch (food and drink) is included with this pass. All Access Passes provide complete access to all IMMERSIVE ITALY and 6th European Immersive Education Summit (EiED) conference activities for all 3 days as detailed on the program and schedule of events. All Access Pass holders enjoy complete access to all keynotes, all featured talks, all presentations, all papers, all demonstrations (demos), all hands-on workshops, all social events and activities, and all meals. Immersive Education VR Headset: All Access Passes come with your very own Immersive Education (iED) Google Cardboard Virtual Reality (VR) headset which you can use during the "Virtual Reality (VR) in Venice" hands-on workshop that is conducted Tuesday June 21 while we ride the world-famous Venice canal gondolas. During this unique hands-on workshop you'll learn how to create your very own VR experiences that you can enjoy with your new iED VR headset! Social and Networking Events: All Access Passes also include the Day 1 opening social dinner and reception that follows the "Virtual Reality (VR) in Venice" hands-on workshop the evening of Tuesday June 21, in addition to the Immersive Meal social and networking Event in the afternoon of Day 2 (Wednesday June 22). 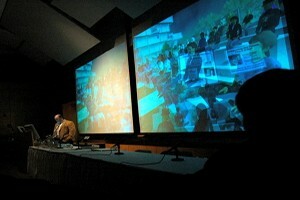 On Day 3 (Thursday June 23) attendees with All Access Passes may also attend "Augment your own Reality! ", a unique hands-on Augmented Reality workshop that extends into the "on-your-own" lunch period, giving you plenty of social time to explore your new skills over lunch with your new colleagues and friends. Students: Get 50% OFF your entire order! Use the promo code STUDENT when you purchase your tickets to get 50% off of your entire order. Requires a valid student ID (bring your student ID to the event). Day 1 passes (Tuesday June 21) include an Immersive Education (iED) Virtual Reality (VR) headset, "Virtual Reality (VR) in Venice" hands-on workshop and gondola ride, and social networking dinner in Venice. Day 2 passes (Wednesday June 22) include the Immersive Meal lunch and social networking event and all hands-on Exhibits during the Immersive Meal period on the 22nd of June (lunch food and drink is included with the Day 2 pass). Day 3 passes (Thursday June 23) include the "Augment your own Reality!" hands-on Augmented Reality (AR) workshop. All Immersive Meal and Exhibits Passes provide access to the Day 2 (Wednesday June 22) Immersive Meal lunch and social networking event in addition to all hands-on Exhibits during the Immersive Meal period on the 22nd of June. Lunch (food and drink) is included with this pass. PURCHASE ORDERS: Contact the Immersive Education (iED) Summit support team for Purchase Orders and invoices. INTERNATIONAL VISAS: Contact the Director of Immersive Education if you require a letter of attendance for your international visa. REFUND AND CANCELLATION POLICY: A 100% refund less a 10 Euro processing fee will be given for all cancellations requested by 31 May 2016 (May 31, 2016). Although no refunds will be given after that date please note that all registrations are transferable to colleagues and associates with prior written authorization from the original registrant.